The concerns livestock haulers have raised about electronic logging devices continue to resonate on Capitol Hill. At a recent appropriations subcommittee hearing in the U.S. Senate, Transportation Secretary Elaine Chao was reminded about such concerns by a pair of Republican senators. “We see this one-size-fits-all regulation having harmful effects on Montana’s farmers and ranchers, and across the trucking and ag industries,” added Sen. Steven Daines (R-Mont.). The secretary assured the senators her staff at the U.S. Department of Transportation is actively looking into the matter and emphasized hours-of- service rules are a focal point. “We’re very much aware of the hardship that these inflexible rules have placed on rural and agricultural interests,” she told Hoeven. “We have been listening to the concerns of senators like yourself about the ELD,” she said to Daines. Livestock haulers have been consistent in their critique of the Federal Motor Carrier Safety Administration’s ELD mandate. In response, the fiscal 2019 funding law provided livestock and insect haulers an exemption. A few days after her Senate testimony, the secretary announced DOT had sent to the Office of Management and Budget a notice of proposed rulemaking meant to reform HOS regulations. With funding and policy measures on the horizon, bet on members of Congress to continue to bring up concerns about ELDs. April 2, 12:45 p.m.: Major players in the transportation community say they are eagerly waiting for additional details on autonomous vehicles policy. 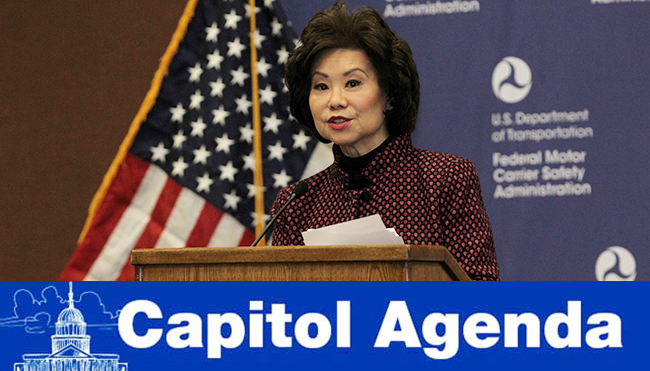 Stakeholders will tune in with great interest to a keynote address Secretary Chao is scheduled to deliver at the Auto Alliances’ Autos2050 Project. April 2, 7 a.m.: Politico interviews Speaker Nancy Pelosi (D-Calif.). April 2, 10 a.m.: The House Interior, Environment, and Related Agencies Appropriations Subcommittee examines the U.S. EPA budget. April 2, 10 a.m.: The House Environment and Climate Change Subcommittee meets for a hearing on climate change. April 2, 10 a.m.: The House Foreign Affairs Committee meets for a hearing on climate change. Witnesses include Ret. Navy Vice Adm. Dennis V. McGinn, former assistant secretary of the Navy for energy, installations and environment; former Deputy Defense Undersecretary for Environmental Security Sherri Goodman; and Paul Weisenfeld, executive vice president for international development at RTI International. April 3, 8 a.m.: MobilityTalks International Forum features former Rep. John Delaney (D-Md. ), and Reps. Bob Latta (R-Ohio) and Jan Schakowsky (D-Ill.). April 3, 9 a.m.: The Senate Interior, Environment, and Related Agencies Appropriations Subcommittee examines the Trump White House’s fiscal 2020 budget request for the U.S. EPA. April 5-14: Washington Auto Show at the Walter E. Washington Convention Center. Infrastructure takes a backseat when talk of repeal and replace Obamacare re-enters the political lexicon. Sen. Amy Klobuchar (D-Minn.), a Commerce Committee member, unveiled an atypical policy point for presidential aspirants: A $ 1trillion infrastructure plan. The new session of Congress gave us a new top Republican on the Highways and Transit Subcommittee. Illinois Rep. Rodney Davis, elected in 2012, is suggesting we think of infrastructure funding the way we do of 401(k) accounts: multiple options. “We, as policymakers, have to take a step back and finally figure out how do we change the funding structure,” Davis said at an Axios event March 28. INFRASTRUCTURE OPTIONS: Davis expounds on Highway Trust Fund financing mechanisms. Several proponents of earmarks on Capitol Hill are referring to the banned practice as congressionally directed funds, or Article 1 funding. Just not earmarks, obviously. Self-described "recovering governor," Sen. Tom Carper, D-Del. and ranking member on the surface transportation panel, addressed climate change and infrastructure on the floor of the chamber. For a long time, you had to be crazy to drive in New York. We publish weekly when Congress is in session. E-mail emulero@ttnews.com with tips. Follow us @eugenemulero and @transporttopics.